Scorpions are arachnids that have long, dangerous, segmented tails equipped with a stinger. Scorpions give birth to babies that climb on the females back and reside there for up to 15 days until their first molt. Scorpions molt 5-7 times within their lifetime and can live up to 15 years. Scorpions are most likely to live in dry, semi-arid regions, but are also located in rural areas within southwest Riverside County. Scorpions are active at night (nocturnal) and spend daytime hours resting under items. They emerge at night to hunt for prey and may sometimes make their way indoors through small openings. 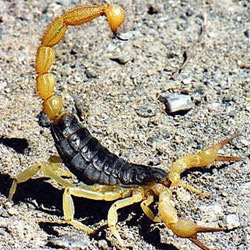 Scorpions feed on insects, spiders, lizards and small mammals such as mice. A female scorpion can produce between 25-39 young after mating. The young remains on the scorpions back for a period of 5-15 days before scattering. A scorpion may venture indoors in search of food or water, since scorpions require a moisture source to survive. Scorpion stings transmit a neurotoxin venom that can rang in degree of severity and allergic reaction. A scorpion can sting multiple times. All scorpions are venomous, but not all scorpions are dangerous to humans. Scorpion stings can produce swelling, inflammation, numbness and pain. In allergic individuals, scorpion venom can produce tragic results if not treated quickly. AmeriGuard Pest Defense offers scorpion control services for geographic locations where scorpions are a common occurrence. Our licensed service technician will perform a thorough visual inspection to identify the severity of your scorpion problem. During the inspection, all sources of the scorpion infestation will be identified and methods of scorpion treatment will be discussed. The technician will also point out potential scorpion harborages, scorpion evidence and suggest mechanical methods of scorpion control where available. A successful scorpion control service depends on the cooperation of our customers. Scorpion treatment services are available on a One-Time basis or as part of an ongoing Monthly General Pest Control service. A scorpion control service can be added to your regularly scheduled maintenance plan. If your property is re-infested with scorpions frequently, our service technician will advise of the best course of action for controlling your scorpion problem. Seal cracks, crevices and other small openings around windows and doorways. Inspect outdoor items such as shoes and clothing carefully. Contact your scorpion service experts at AmeriGuard Pest Defense for a scorpion treatment quote. Most quotes for scorpion services can be provided over the phone without any obligation. AmeriGuard Pest Defense’s Scorpion Maintenance Program will help eliminate current scorpion as well as help prevent future scorpion problems. Scorpion Maintenance can be added to any General Pest Control Maintenance Program for a minimal amount. No contracts required! Both the inside and outside of your home are always under warranty. AmeriGuard’s Scorpion Defense Program guarantees your satisfaction between regular scheduled maintenance with unlimited free re-services. If at any time you find yourself in need of an additional treatment between regular scheduled services, call us and we will return to re-treat your home absolutely free!